This is a 100% Native American owned website. Ya'ah t'eeh. My name is Doug Norton and I am a full-blooded member of the Navajo Nation. I am of the Bitter Water Clan, born for the Tangle Clan, my maternal grandfather is of the Folded Arms Clan and my paternal grandfather is of the Black Streak Wood Clan. I was raised in Tsaile, Arizona, which lies in the heart of the Navajo Nation, and even though I now reside in Mesa, Arizona, and have boys of my own, I will always be just a boy from Tsaile. You will find only genuine Native American flutes at Tsaile Boy. Unfortunately, there are many Native American flute websites on the Internet that sell Native American flutes that are not made by a Native American. The flutes crafted here at Tsaile Boy are genuine Native American flutes. I craft every flute we sell at Tsaile Boy so you can be assured that your flute will be a genuine Native American flute. We specialize in custom Native American flutes. The Native American flute is a special kind of musical instrument. For many, the appeal of the Native American flute comes from the soft and soothing sound that brings peace and tranquility to those who are playing and to those who are listening. For others, the sound of the flute brings the hope of finding and capturing the heart of a loved one. For others still, the Native American flute brings about or helps in the healing of physical, emotional or spiritual infirmities. And for others, the Native American flute is not obtained for it's musical abilities but for being a work of art. For these reasons, the Native American flute is special and we, at Tsaile Boy, believe every flute should be made upon request, according to the needs and desires of the customer. Here at Tsaile Boy we are aware of the difficulties in finding the "perfect" flute. Traditionally, this was not a problem since we were not in a rush to acquire the things we desired. Time was spent getting to know one another and making arrangements for the trade we were seeking. Time was needed to both gather the proper materials and to make the desired item or items. A "price" would be negotiated in a respectful manner. Our mission is to hold to the traditions of our grandfathers and perform our business in a manner as close as possible to the old ways of doing things. By custom, I mean that you, the customer, get to choose the most important flute features to make it the "perfect" flute for you. a flute with an animal "bird"
Take a look at the flutes and other products we have shown on our website. 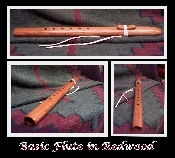 Pictures are of previous flutes that I have made and either sold or traded with 100% customer satisfaction. If what you are looking for is not pictured, or not considered an option, contact me and we can discuss what you envision as being the "perfect" flute. Basic Flute Bird of Prey Flutes Birds Flute with Animal "bird"